Most NYC households don't own cars, and those that do tend to earn much more than those that are car-free. Timed to coincide with this weekend’s car-free events, the Tri-State Transportation Campaign has released a fact sheet on car ownership rates in NYC. Compiled from 2015 U.S. Census data, Tri-State’s fact sheet shows that most households citywide don’t own a car, car-owning households tend to be more affluent than car-free ones, and the vast majority of New Yorkers don’t drive to work. These facts have remained constant for years, but it’s been some time since anyone compiled an update with current information. 54.5 percent of households citywide are car-free. Citywide, the median income of households with cars is more than twice as high as the median income of car-free households. 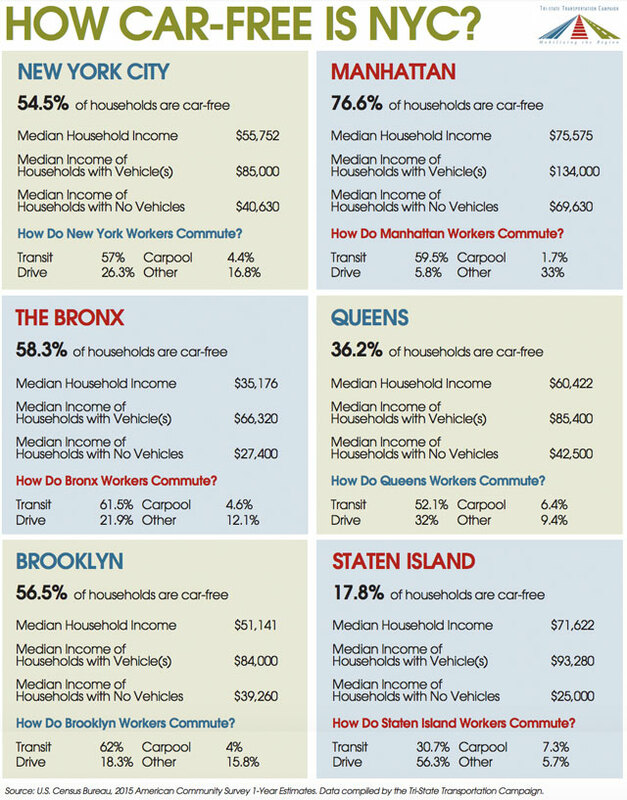 The income disparity between car-owning and car-free households is stark in every borough, and most pronounced in Staten Island, where the median car-free household earns 73 percent less. Manhattan has the highest share of car-free households (76.6 percent), and Staten Island the lowest (17.8 percent). Many car owners don’t drive to work. Though around 45 percent of households citywide have a car, only around 30 percent of workers drive or carpool to work. The majority of workers in every borough take transit to their jobs — except in Staten Island, where 56 percent drive. The fact sheet is an update to those TSTC released in 2007 to bolster the case for congestion pricing. Since then, politicians have continued to cite the mythologized car-owning working stiff to oppose toll reforms that would cut traffic and fund transit. That narrative still doesn’t mesh with reality. There have been small fluctuations in the car ownership rate since 2000, when it stood at 44.3 percent. While the current rate is about a percentage point higher, it’s down from 46 percent in Census data collected between 2005 and 2009. 140,494 more passenger vehicles in NYC today compared to 2007. Biggest increase in Brooklyn, a surprising +12.5%. Someone is buying all those vehicles and it must be the middle-class because the rich are a small group and the poor usually can’t afford a car. One issue I have with how this data is being used by Brad is that it shows commuting patterns overall. If the purpose of citing these numbers is to argue for MoveNY or any other congestion charging system it’s probably more helpful to show what percentage of residents commute into Manhattan by car. I doubt many outer boro residents are commuting into the CBD by car, rather they may have jobs elsewhere where transit is less optimal. (These individuals while being car commuters would likely not oppose MoveNY). The sort of breakdown we just saw for the Bus Turnaround would be brilliant in arguing for tolls on the East River bridges. If however, we are using this to argue that the rich can afford to pay more to drive or that the folks who drive daily into the CBD are not in fact middle class I guess this supports that. As I suspected, much of Queens’ streets appear to function as parking lots for people who would like to be able to drive occasionally. Car owning households tend to be larger as well. How do the numbers look if you normalize by household population or workers per household? Those stats you posted are really useful! The 7.48% increase in passenger cars registered in NYC in 2015 vs. 2007 computes to an average annual increase (non-compounded) of 0.94% per year. Population grew in that period, of course, but not as much: By 4.4% from April 2010 to July 2016 (okay, not-identical period). That averages to 0.70% per year, non-compounded. So NYC vehicle ownership is rising faster than population. The Brooklyn numbers in particular are surprising considering how most Brooklynites homes or apartments don’t have driveways or garages, and the ASP rules are a nightmare – still 4 days per week in many neighborhoods. The most car-dependent borough, SI, had the smallest increase (+5.03%) in that same time period. The housing boom has slowed down as there is little land left to build on, and in most of the island only 1 and 2 family homes can be built. But those 12,000 additional cars have a greater impact on our traffic because of the limited arterial road network. But like 99% of SI homes have at least a driveway and ASP exists on only about 5 or 6 locations on the entire island. Isn’t some of this just population change? According to the Census population estimates, Brooklyn gained 108k people between 2007 and 2015, while Staten Island lost 7k. I’d believe that the new families moving to Brooklyn are bringing cars at a greater rate than the older ones moving and dying out. And as time goes on, more of the housing stock has more off-street parking. Brooklyn was largely built without off-street parking, but every year more new development comes on line that has it. I think the “carfree” in Staten Island is more reflective of poverty. You can see in the graphic above, they’re the poorest group. They likely wish they could afford cars, unlike Manhattanites who have no need. Look above to Komanoff’s post. Car ownership rose faster than population. Where did you get that SI lost 7k people? No borough lost population between 2010 and 2016. But I think you’re right about poverty and car ownership on S.I. The population loss in the estimates is between 2009 and 2010, so it’s likely that it wasn’t actually loss… it was just that the estimates were too high and the 2010 Census corrected the numbers. Regardless, Brooklyn had a significant population increase over the past decade but Staten Island did not. by steadily encouraging development of housing on parking lots, as well as improving transit options, we’ll see less availability of motor vehicle storage space.